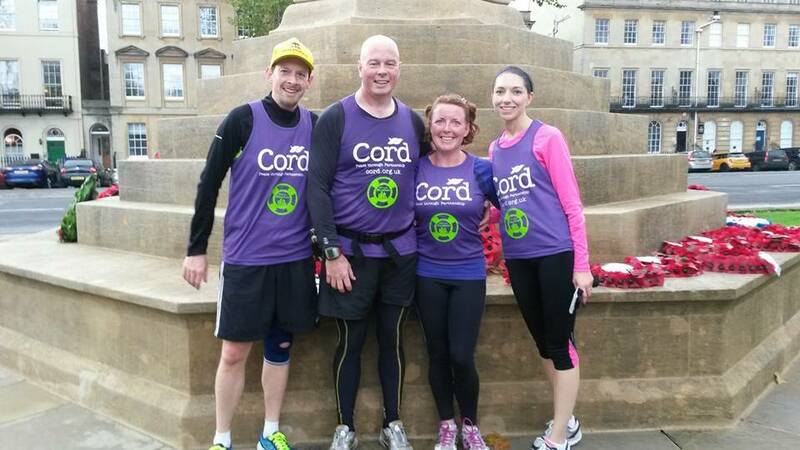 To run 26.2 miles in one day across 4 towns/cities in the UK, spelling out ‘CORD’ – the name of the charity the run was in aid of. The challenge was set for the 15 November 2014 and we gave ourselves just 10 weeks’ notice to prepare. 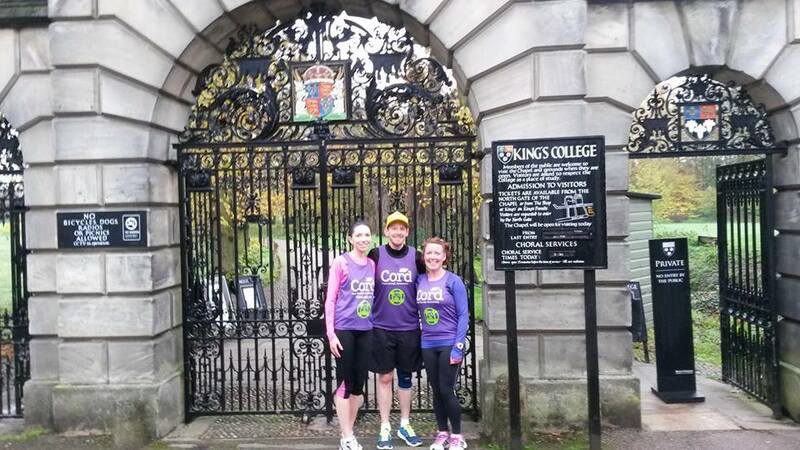 The training for this event was very different to a normal marathon as it involved a lot of stop-starting. There was an early start, a lot of driving and sitting still and a late finish. You burn off lots of energy and get hungry but you have to be careful about what you eat and drink and when you do so. You have to warm up and cool down a lot and the chances are you will pick up some injury. This is a test of endurance for the mind and the body. To raise £500 for Cord’s Solar Cooker Appeal and we did it! Thanks to our very kind family, friends and colleagues, we managed to raise money online and the old fashioned way! We started our journey at 6am in Warwick having fuelled up on porridge and a couple of glasses of water. The journey was lovely and quiet and we arrived on time. The route we picked was mapped out for us by Neil Costello of the Cambridge and Coleridge Athletics Club. We had printed off maps to use on the way around which worked perfectly well and thanks to Ben and Crawford, Kate and I could spend time catching up as we could just follow them. To me, this 6.2 mile run felt easy – much easier than in training. I think this was because I was geared up for it, had great company on the way round and had such a stunning city to indulge in. There was no time to even think about how I was feeling. This time…..take a bike tour! And if you want a unique experience, try the Cambridge College Supper Club! We started our journey to Oxford at about 9:40am but didn’t arrive until about midday due to the traffic and road closures (that we hadn’t banked on!). I devised the 7.8 mile route for this run and in hindsight, taking us through the busy streets of Oxford was possibly not the best idea (trying to compete with Christmas shoppers on a busy Saturday afternoon is not wise!) although we got to see some of the beautiful buildings Oxford is home to, including The University Church of St Mary the Virgin which we had a quick picture in front of. Enjoy a well earned lunch at Brasserie Blanc. We sampled this last year and what a delight. We visited Le Manoir aux Quat’Saisons in the summer and cannot wait to return to sample a taste of Raymond Blanc’s influential food. And in the New Year, we will return to see the William Blake exhibition at the Ashmolean. After a quick change, cool down and refuel, we headed to Reading, an hour away. When we all got out of the car, I don’t think anyone was free of pain. Crawford had a problem which his achilles, Ben with his knee and Kate and I had problems with out feet. I could barely put my foot to the ground but found a solution – I put 4 socks on my injured foot. 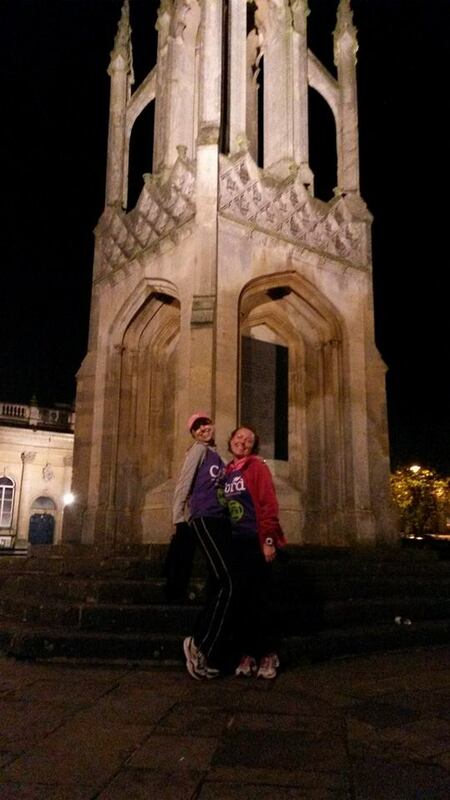 We had 9 miles ahead of us but decided to change this to clock up more miles in Reading and leaving less for Devizes. In the end we made it to 9.8 (having taken a wrong turn otherwise, we would have gone further). Despite all the injuries, we managed to run most of the course and many issues were ‘run off’ but we did have a few more breaks than intended as some of the injuries were just too painful to continue. One odd thing I found about Reading was that although it was the only location with real hills, I actually enjoyed them despite hating them in training! Visit Basildon Park, a Georgian Mansion surrounded by Parkland and restored in the mid 1950s. Our last stop was just over an hour away from Reading. We had left ourselves 2.4 miles to run, shuffle, walk (or be dragged) around this picturesque market town. We arrived at just after 8pm and so it was in darkness but for a few street lights; we will return another weekend to make the most of it. Walk around the town in the daylight and take in the market square (we have a poor quality picture of this at the moment due to the lighting and because all pictures from this event were taken on a mobile phone – more portable than a DSLR!). 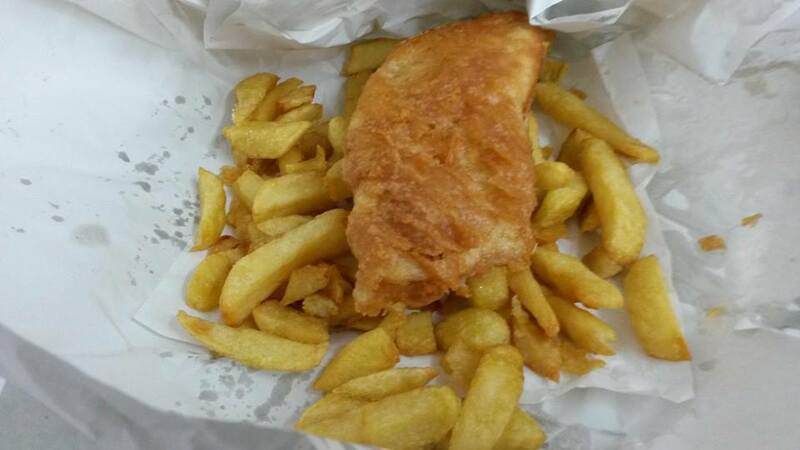 If you’re feeling peckish and want a quick bite to eat, try Lee’s fish and chips in the centre. After our day, our fish and chips (at 9pm!) were the most wonderful thing! 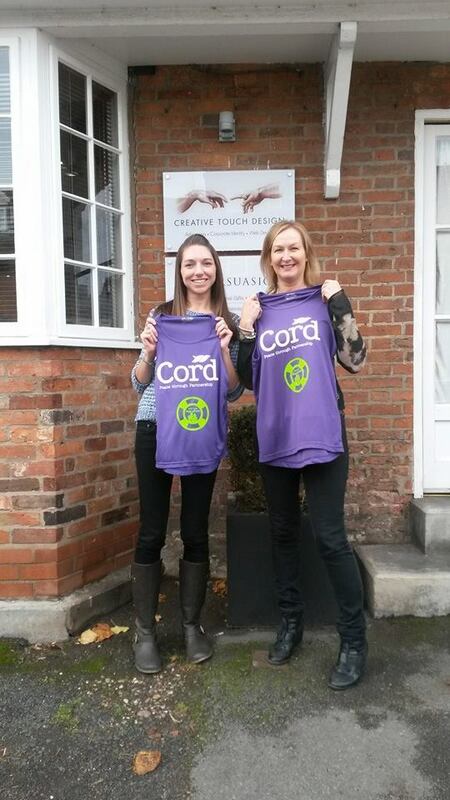 I must say a huge thank you to Caroline Dolan and all at Cord for getting behind us with this and providing lots of support, to Creative Touch Design for printing our running vests, to Neil Costello at the Cambridge and Coleridge Athletic Club and to everyone who sponsored us. Also, a thank you to Kate, Crawford and Ben for agreeing to take part in this crazy challenge of mine – you are all truly amazing!! 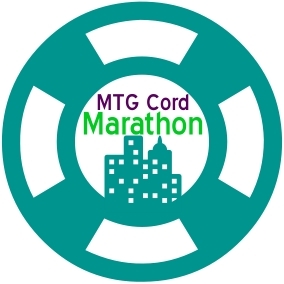 There are less than 2 weeks to go until the MTG Cord Marathon. In my last blog I mentioned how we were up to 6.2 miles. Looking back that doesn’t seem much but at the time it was literally couch to 10k in 4 weeks and I could hardly believe I was able to run 10k. It is just under a month ago I wrote my last blog and again, since this time we have achieved so much. We are pretty much set to go with just one training run left this weekend and then it will be carbs all the way next week in the build up. 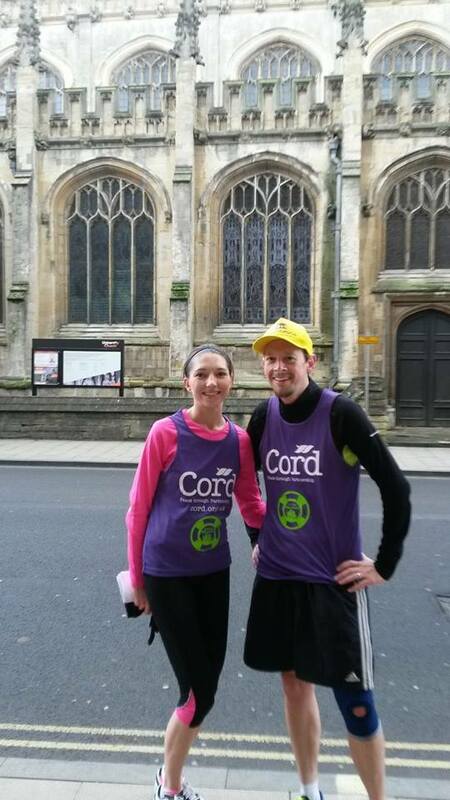 Thank you to Cord for being so supportive every step of the way, to Creative Touch Design for printing our running vests, to Neil Costello from Cambridge and Coleridge running club for your guidance, to Kate, Crawford and Ben and to everyone that has donated to this cause. Don’t forget, there is still time to donate by clicking HERE. In training, we jumped from 6.2 miles to 10 miles and that is where I found my limit. Up to 9 miles it was manageable but I hit 9 miles and I came up against a hill (relatively minor but it seemed like a mountain at the time). I stopped and walked a bit and then carried on and past the 10 mile marker to accomplish the next hill to prove hills couldn’t beat me. The following week we did 2 x 4 mile runs followed by 3 x 4 mile runs the next week and this weekend just gone we managed a 4, 5 and 6 mile run on Saturday. This is a different way of training. Unlike the usual marathon where you have to keep going for 26.2 miles this is different because it’s very ‘stop-starty’. So, when you finish your first run, your body thinks that’s it and starts to tighten up which then makes the subsequent runs a little more tricky. I find that my first run is a nightmare. My muscles struggle, my lungs feel like that may just make it to a mile and my mind is unable to focus on anything but the difficulty I am having. I often think I am never going to make a mile let alone 26.2 of them. However, the second run gets a little easier and the third run is bizarrely the most comfortable for me as far as my mind and lungs are concerned. My ankle injury starts to play up in the third run and I get this pain in the top of my right leg but you forget it’s there after a while because you’re so focused on the goal. I also think about certain people when running. First, the amazing Davina McCall. I think about all that she has achieved in her crazy challenges and that spurs me on. Then there’s Jillian Michaels who has been shouting at me through the TV for the last 3 years and encouraging me to not give up. When I come to a hill, I always have her voice in my head. Then there is my inspiring cousin, Stephen Ward. When I have a tough moment I think if everything he has achieved and that make each step a little lighter. Finally, there is my husband, Ben, who is a much better runner than me and always runs behind (put your slowest member at the front!) and constantly gives me encouragement. I have found hills difficult the last few weeks. There is a set route for our 4 mile run and I have stopped at one point a couple of times but now it is becoming a habit and conveniently, it’s at the bottom of the hill and I simply walk to the top which means no hill for me to run on that section of the route. I had a hill on my 6 mile run on Saturday and I couldn’t stop thinking about it on the way round and when it came to it, I kept telling myself to face my limitations because if you don’t fight these you get to keep them and I didn’t want hills to be my nemesis (thank you Jillian Michaels). I know that my lungs can get me to the 26.2 mile mark and on the day we will be visiting some very lovely places and have team support and so I am positive that my mind will get me to the end. The only worry I have is my muscles but I will get to the end even if that means staggering the last few miles. 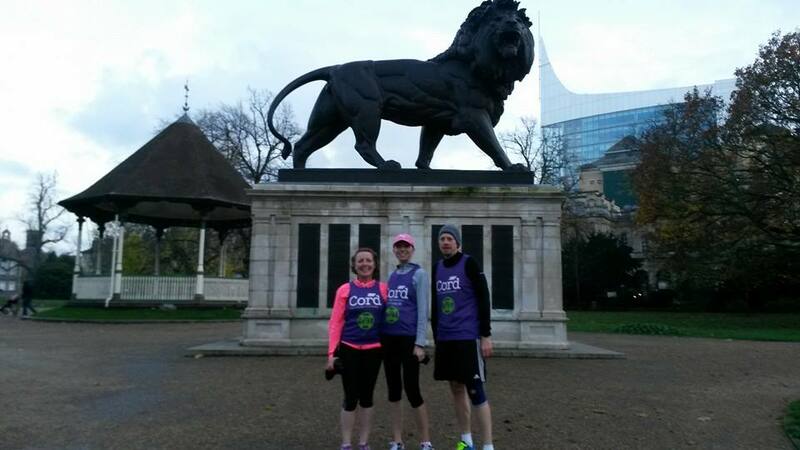 We have all been busy training for the Marathon in a day on 15 November and are not feeling quite so scared any longer (I may be the exception to that!). 26.2 miles is a long way……I have discovered……having run a maximum distance in training of 6.2 miles! So far training has included strength training will Jillian Michaels, sadly not in person, road running, climbing Snowdon, Taekwondo classes, yoga, kickboxing and most importantly of all, positive thinking. I have only completed 4 runs in the last year, the first being about a month ago. I started with 3 miles and had to stop about 3 times on the way around. I then re-ran that same route a few days later and managed to complete it without stopping. The next hurdle was 4 miles and again, no stopping and I felt I could give more. This weekend was only the fourth run in a month and I am up to 6.2 miles and again, I had more left to give. The trick is to think positively. When I start running I feel that my lungs could explode after about 10 minutes but the key is to push past that and carry on and think of something else. I often find planning the logisitics of the run in November helps. Before you know it, your breathing has slowed to a normal rate and you have completed the best part of a mile. This weekend I was running with my husband who will be part of team MTG on the 15 November. I said that I felt my legs were running and my body was along for the ride. I found it harder to stop and was determined to just keep going. We were back to our starting point in just under an hour feeling optimistic and ready for our next challenge. Exciting news this week! The founder of MTG has decided to run a marathon in the course of a day for our charity of the year, Cord. Taking in the sights in Cambridge, Oxford, Reading and Devizes it is expected the adventure will take 16 hours to complete. To read more click here.